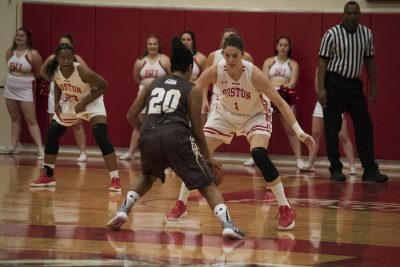 Case Gym was rocking with 407 spectators Saturday afternoon for Senior Day, but the Boston University women’s basketball team still fell to the United States Military Academy 48-47. The Terriers (10-17, 5-12 Patriot League) were outscored by the Black Knights 16-9 (16-12, 9-8 Patriot League) in the fourth quarter for a come-from-behind victory. BU head coach Katy Steding said she is very appreciative of her seniors and what they have done for the program. Army took an early 9-4 lead, with two players doing the damage. Senior guard Daizjah Morris had five and junior forward Madison Hovren put up four points to pace the Black Knights early on. Army led 14-11 after 10 minutes. Senior guard Corrine Williams did it all in the first half, as she scored four points, three rebounds, two steals, two assists and one emphatic block. A scoreless first three minutes of the second quarter for the Terriers allowed the Black Knights to take a seven-point lead. Sophomore forward Nia Irving cut the deficit to two with 4:49 left in the half, after a steal from freshman guard Katie Nelson. Senior center Sophie Beaudry was in early foul trouble, and had to sit for the last two minutes of the first half and the first five of the third after accumulating three personal fouls. The Army led 25-22 at the half, with senior forward and center Lena’ Hicks and senior guard Janae McNeal scoring six apiece. Irving was the only player to score in double figures in the first half with 10. The Terriers were able to capitalize on Army’s turnovers, scoring 10 of their 22 first half points off giveaways. The Black Knights out-rebounded BU 18-13 in the first, mainly thanks to senior forward Margaret Anne Hubbell who tallied five. A Williams three, the first of the game for the Terriers, gave BU its first lead since the score was 4-2 in the first quarter. BU opened up a seven-point lead courtesy of a layup and foul from junior guard Payton Hauck. The Terriers began the third quarter on a 11-1 run to take a 33-26 lead. A back-and-forth end of the third quarter saw BU lead 38-32. Army cut the lead three before a Beaudry layup brought the lead back to five less than four minutes in to the quarter. However, McNeal scored for the Black Knights, bringing Army within two at 41-39 with just over four minutes to play. She then tied the game after a stop. McNeal would finish with a game-high 18 points. Two Beaudry free throws made it a four-point Terrier lead with just under three minutes to play. A three from junior guard Jess Lewis and a layup from Hovren gave the Black Knights a 46-45 lead. Nelson was forced into a turnover although it seemed like Steading called timeout before the turnover had occurred. The officials did not grant the timeout, and McNeal would hit one free throw on the ensuing possession. Steding was visibly angry with the officials, but said she knew the call wouldn’t change no matter what she did. “I’m upset about the missed timeout call and I’m screaming at the top of my lungs, but even my coaches said you can’t do anything about it now,” Steding said. With 25.3 seconds left and down two, Beaudry connected again from inside to tie the game at 47. McNeal was fouled with 7.1 seconds to play. She made the first but missed the second, and BU called timeout with 6.6 seconds left to try to draw up a game-winning play. Junior forward Naiyah Thompson had a decent look, but her jumper was too strong and the Terriers fell 48-47. The team was frustrated after the game, but Steding preached to put the matchup in the rear-view mirror and focus on the Terriers’ big game coming up against Loyola University Maryland on Wednesday.